Civic Spirit Educators are currently in process creating different courses and clubs to cultivate civic learning within their schools. Throughout the year, Civic Spirit Scholars will design and implement civic action and engagement projects within their community. Central/YUHSG has officially launched Civic Spirit in their school! Watch their launch video HERE. 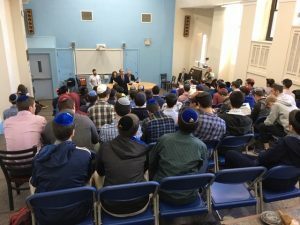 The Heschel School hosted Ruth Messinger to talk with high school students about the importance of civic responsibility. MTA/YUHSB Honors College hosted a panel on Power, Politics, and Leading a Nation. Principal for General Studies Dr. Seth Taylor moderated the panel. We look forward to sharing more details throughout the school year.